Please note: This history of the town was published in the 1936 Northern Monarch Year Book. Thank you Gregg Vaillancourt for giving me the opportunity to peruse this fascinating record of our past. CAPREOL is a town situated on the banks of the Vermillion River about twenty-two miles north of the city of Sudbury. It nestles in a valley surrounded by the Laurentian Highlands, and owing to the character of the surrounding hills, it is supposed that this valley was at one time a glacier-lake. With the passing of time, the water receded and left quite an area of comparatively level gravelly ground. It is on this that the town of Capreol is built. Historically the Indians roamed throughout this section of the country, even before the white man visited this area. After the coming of the Europeans who were in search of furs, numerous trading posts were established. One of these was erected on the shore of Lake Wanapitei, about eight miles from Capreol, and it was to this that the Indians took their furs. The first men to come to this part of the country were Messrs Mack and Frank Dennie, who were prospecting, hunting and trapping. They constructed a cabin of pine walls which were chinked with branches. It had a pointed canvas roof. 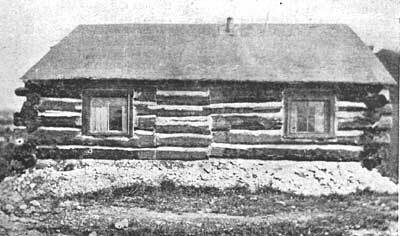 This, the first building on the present townsite, was situated about fifty feet from the edge of the river, somewhere in the vicinity of Mr. H. Bertrand's old store. The surveyors under Mr. MacLavin mapped the route for the Canadian Northern Railroad as far as Gogama in 1902. The original course was across the Vermillion river at the rapids near Green's lake, through the virgin forest until it recrossed the river where the dam now stands, and on to the westward. The old road was under construction in 1906, and after its com-pletion it continued in use until 1915. That section on the other side of the river is now known as the old sub-division. During the time that this, was in operation, a small station named Orefield (because of the finding of ore near the Iron bridge and the field-like area nearby), was erected in the viinity of Mr. J. Marshall's house; that is, near the point -w e the present track meets the of roadbed. It served the need of t settlers and prospectors who came to this location. With the passing of time, it was found that it would be practical to have a branch line connecting North Bay with this railroad. This necessitated bringing the main line on this side of the river in 1911. The building of new roadbed from the "Gravel Pit" to the "Iron Bridge" was a great undertaking, and required considerable cutting, filling and gravelling. The area where the station and the yard now stands was a wide gully and had to be filled in with gravel which was procured from the other side of the river. The knoll behind Mr. Marshall's house was cut down to straighten the track, because the old line skirted it as far as the bridge. When they Canadian Northern Railway decdided to give a transcontinental service, they had to have a divisional point every one hundred and twenty miles, and as Capreol wan the nearest and most suitable centre for such, we find it needed a station, round house, car shops and a yard suitable to service. In 1915 the station was built on its present site, and as the town grew, it was enlarged until in 1919 it was finally completed. West of this a telegraph office was erected, and to the-the north-east the round-house containing eight pits was built. In 1923 this was enlarged to fifteen stalls, and in 1925 it was further enlarged to twenty. The people who first came to live here were Mr. Anderson, Mr.J. Bland, Mr. F. Taciuk. Mr. Anderson was the section foreman and lived somewhere in the vicinity of the "Bridge and Building Yard". Mr. Blake was telegraph operator and lived with Mr. Anderson until they moved in a house built behind Mr. Nepitt's general store. Mr. Taciuk, the sanitary inspector, also lived with Andersons until he had built his own house where Mr. Kennedy now lives. Soon after a mumber of families moved in. They lived in the cars that were sidetracked near the shops. A few of these were Mr. H. Dunsby, Mr. J. Amer, Mr. G. LaMache, Mr. J. Sharkey, Mr. H.Ainsworth, Mr. E. Liberty, Mr. Dotey, Mr. A. Stewart, Mr. J. McLean and Mr. J McNicoll. - They remained in these to temporary quarters until some houses were built by the company for the use its employees. the vicinity of the Municipal Buildings by a small stream which has become known as "Tin Creek". Planks were placed over this to allow people to cross it. A log bridge was erected and remained in use until it was removed in 1920. At night people who ventured out had to carry lanterns, because many small shrubs and bushes were still growing in the streets. Before Capreol was incorporated as a town in 1918, it was operated as a school section. Mr. Joseph Cather was the first secretary. The school itself was a railway coach. Miss Vansyckle was the teacher. Quite frequently when pupils went to school in the morning they would have to scout the yard their "school," as the car was often moved during the night. This remained in use until 1915, and then a school was built in the vicinity of the Baptist Church. Miss Casselman was the teacher here. 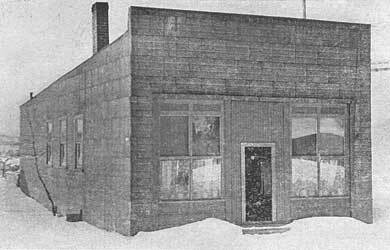 In 1919 the Capreol Public School consisting of four rooms, was erected, and two years later, in 1921, four more rooms were added. In 1926, the Capreol Continuation School was erected. This was an additional improvement to the educational facilities of the town. In 1935, the Continuation School was raised to the status of a High school, and in September of this year was opened as such, with an enrolment of 120 students and a staff of four teachers. The present staff consists of: A. D. Herbert, B.A. Pricipal, Miss K. Anderson, R.J. Wallace, B.A. and L. Gilbert, M.A. The School Board consists of C,. Virtue, Chairman, Mrs. C. Gilbert, M.A., Secretary-Treasurer, Mrs. W. McCann, Mrs. E. Hawker, J. Scott, J. Linge and P. Berry. The growth of the town by leaps and bounds necessitated local improvements, and in 1920, there were two and a half miles of hydro electric lighting system installed. In that year the first sidewalks were laidone and a half miles of themand these have been gradually added to during the past years. In 1928 and 1929, tie latest improvements were made, in the addition of the waterworks and sewer system, which including the sinking of two wells, and the installation of pumps, has certainly placed the town among the most modern in Northern Ontario. A new townhall was erected in 1929. It houses the town office, fire station, council chambers, the office of the chief of police, and the jail. The opening of this was attended by notable figures of the district: Hon. Chas. McCrea, Mr. Mac Lang, ex-M.P., Mr. Cyril T. Young, and representatives of the towns in this district. With one accord they commended Capreol for its modernity and progressiveness. The present council consists of: Mayor. Mr. J. E. Coyne; Councillors, Mr. W. H. Johnston, Mr. C. Metcalfe, Mr. P. Coyne, Mr. E Tetreau and Mr. Henry Deavy. Mr. P. Studer is the Town Clerk, and Mr. J. B. Wright the Assistant Clerk and Assessor. Mr. George Conron is the chief of police and Mr. J. H. Blackwell the chief of the fire department. To build up the religious life of the community has been one of the chief aims of the citizens, and five well equipped churches minister to the Christian needs of the people. Trinity United Church, Rev. Mr. McBrien, Baptist Church, Rev. Mr. Lawson, Pentecostal Tabernacle, Rev. Mr. Locerbie, St Alban's Anglican Church, Rev. Father Wood, and the Roman Catholic Church, Rev. Father Baker, allow the citizensto worship in the faith of their fathers. Connected with these churches are the various organizations which assist in the work of the church. As the chief industry of the town, a diVislonal point on the Canadiajn National Railway, provides employment, either directly or indirectly, for its citizens, we find that its leaders take an enthusiastic interest in the social, athletic and business life of the community, and with the assistance of the C. N. R. have helped to bring Capreol to its present high place among the towns of Northern Ontario.